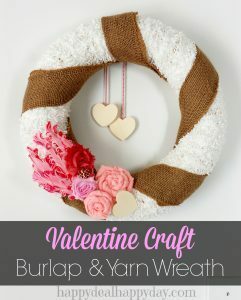 DIY Valentine's Day Wreath with Yarn and Burlap | Happy Deal - Happy Day! I get a little sad each year when its time to take down my indoor Christmas wreaths. Mid January-February isn’t an appropriate time to put up my Spring Forsythia wreath yet, so I needed a Valentine’s Day wreath for these cold and dreary months in NY to brighten up my home. That’s when I pulled out a blank wreath, some white tizzy yarn, some burlap, and pink felt. And of course to make this Valentine’s day appropriate, I added some wood hearts. This DIY Valentine’s Day wreath is easy to make – and it sure is a happy piece for my home during what could be the dreariest season of the year. **1 skein of Bernat Tizzy Yarn (3-Pack) Marshmallow White (you may be able to get a skein cheaper at Michaels with a coupon) **Tizzy Yarn has since been discontinued since I made this, so try it with this white loop yarn. I left the plastic on the straw wreath, and wrapped it with the tizzy yard. I wrapped it twice, to be sure it was fully coated in white and it left no gaps in between the yarn. Then I had to fold my burlap in half because it was wider than the ribbon you can get at Amazon. But if you just have burlap ribbon, then wind that around your wreath and hot glue into place. I played around for awhile trying to make burlap flowers and felt flowers. My burlap wasn’t weaved tightly enough, and wouldn’t form flowers no matter how hard I tried. 🙂 I finally followed this You Tube burlap flower video and made some flowers out of pink felt I had on hand. I also had this adorable feather girls headband. When my daughter was a baby, she wouldn’t keep this on her head. So I’m glad I found purpose for it. It’s very Valentine-ish and thought it was a great way to use it for a craft project! I also took some pink yarn, and glued it onto one side of a 2-inch wood heart. I glued a second one onto the back, so that if the heart spins while hanging, you won’t see the glued on yarn. I glued 2 of those on the back so that they could dangle in the center. I added one more wooded heart on the front as the final decor piece on the wreath. With a little love, and a lot of hot glue, a beautiful Valentine wreath is born!!! How about you? What is your frugal craft to make for Valentine’s day??? Find more frugal craft ideas over here! This is so adorable! I need a new wreath for our front door and may just have to try my hand at this one. Thanks for sharing! 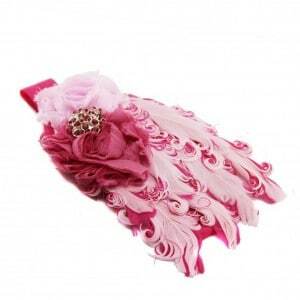 I hope you do make one Leesha – it is fun and they look fabulous!